The four locusts represented in that verse went after the wheat and DESTROYED it. Each one represented a different place of the wheat stalk from the root, to the stalk, to the blossom and fruit that they targeted and ate to the point of destruction. But HE said, I AM making up! THAT’S A GOOD WORD for today. Take hold of it and declare that He is MAKING UP for you what was destroyed. Receive His blessing today which says, “And you shall have PLENTY to eat and be satisfied.” Joel 2:26. 2016 is gone. Whether the year was good to you or incredibly unkind, it is gone and the new has come. It’s time to move ahead into a fresh year with a fresh anointing. As I was praying this morning for friends who have experienced a season of unjust circumstances, the Lord spoke a word to me that I feel is for many. It is found in His Word. As you read it let it remind you of Who He is and that He never changes and always acts from His nature. This is what He is delivering for 2017. I AM a God who restores that which was stolen. When Pharaoh finally released the Israelites from their slavery in Egypt, they left laden down with gold and silver. Those that had oppressed them for over 400 years were now finally repaying them for those years of injustice. They left with payment for the years of slavery…plus interest. God didn’t just deliver them. He also provided for their needs in the new land by restoring what had been stolen. 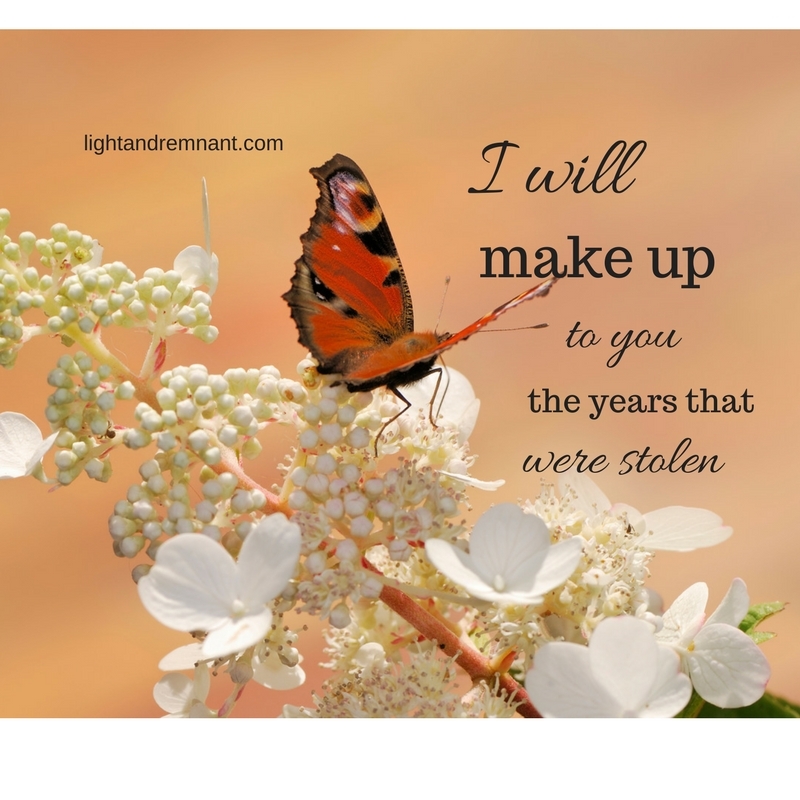 Know that God is restoring to you that which has been stolen from you WITH INTEREST. As the Israelites traveled, He spread a cloud for their covering by day and a fire to illumine their night. They were traveling by a way in which they had never been and frankly they did not know their destination. They had to follow His lead. And God gave them a cloud by day and fire by night that would guide them along the way. These elements also served as protections to cover them and be a shield for them. Know that God will not leave you unprotected as you walk in these new realms. He is both your shield and your guide. Do not fear or dread because of the past season. Leave it behind as you walk in His Protection. The children of Israel asked Him (rather complained to Him) about their steady diet of manna and so He delivered quail—an abundance of quail. He also satisfied them with the bread of heaven and caused water to flow out of a rock. He provided for their every need. But this is important, not only did He provide for their needs, but He satisfied their desires. Quail wasn’t a need, it was a desire. He provided it simply because they asked Him (albeit in a complaining way). How unfortunate that even as God continued to provide in every way for them, the Israelites were often ungrateful and complained. They stifled their own blessing and prolonged their time in the wilderness because of it. It is important that we learn a lesson from their story and keep a thankful heart so that we stay in His flow of blessing staying willing and obedient to Him. We must recognize that it is His very desire and nature to bless us. Know that as you keep your heart in a thankful place that God wants to bless you and provide for not only your needs but the deep desires of your heart. Ask Him. Your blessing is on its way. I AM Restoring Your Joy. When He brought them out of the land of slavery, He brought them out with joy. He deposited back into them an emotion that had been missing in their lives for some time. When we experience slavery (a place where we are held captive) and abuse, when things have been stolen and when value has been withheld, it is hard to have joy. The Israelites had forgotten that emotion. And so not only did God deliver them out of Egypt and slavery, but He restored joy to their hearts. This is a bigger aspect than some may realize, for when there is an absence of joy many things follow. Sickness and depression are illnesses that stem from the absence of joy. Scripture says, “A joyful heart does good like a medicine.” Joy actually begins to restore health to our bodies. If that is so, then it can be reverse engineered to see that the absence of joy can open the door to sickness. Depression is the absence of joy. It is an oppression that has descended upon a heart and mind. 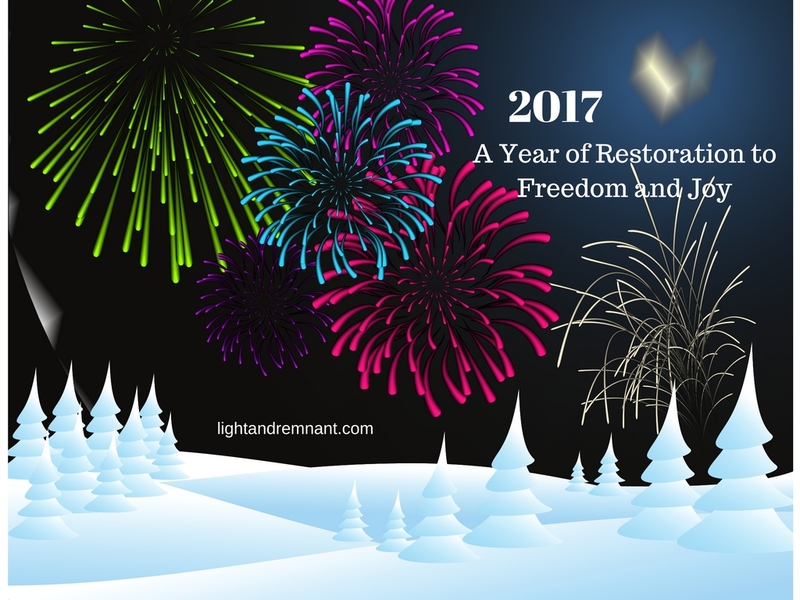 But God said in this year He is RESTORING joy. Take hold of this promise that as God is moving you out of the land of slavery and whatever has held you and challenged you in this past year. You will walk OUT, just like the Israelites walked out of Egypt. But remember they had to take steps to walk out once they were released. And as you walk out and leave the oppression and fear behind, He will restore your joy. 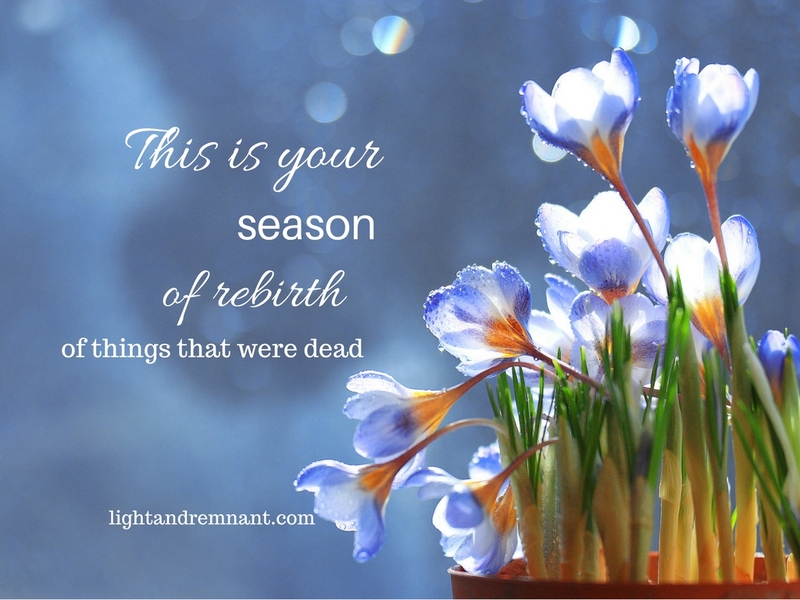 Take hold of the joy that He is restoring in this new season. You have forgotten how to be joyful, but God is restoring to you the ability to have joy and to rejoice. However, there are two stipulations. It requires that you must receive it and then cast off like a cloak the oppression and fear of the past. You cannot walk in joy and hold onto fear. It doesn’t work. Cast it off as you walk out of the past. As you look to 2017, may you do so with joyful expectation. God is taking you out of a place of slavery to a new land. The word He spoke was that He is restoring, protecting, providing, and instilling joy. Remember Who He is for He does not change. He delights in you and He delights in blessing you. Leave the past in the past and take hold of the present for it is His present to you for 2017. If you sense this word is for you, please let me know by leaving a comment below. 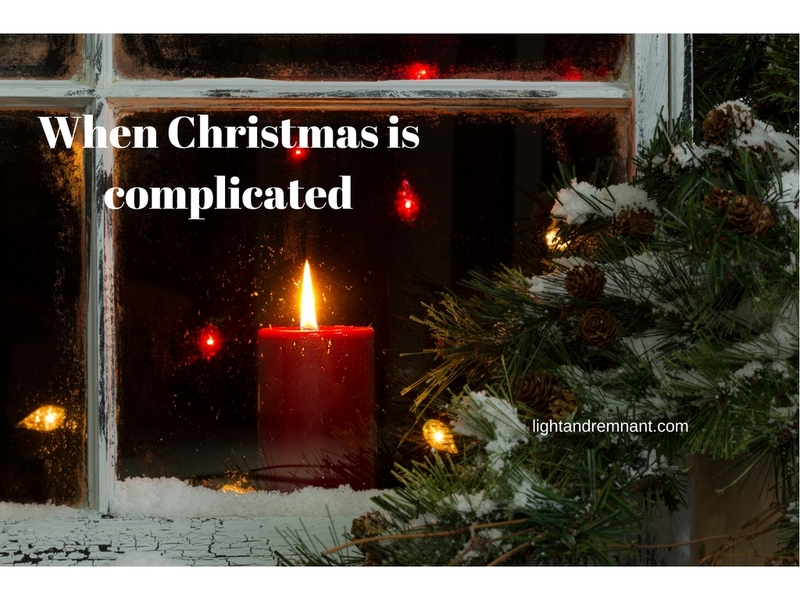 On Sunday my pastor preached a message about “When Christmas is Complicated.” I understood that sentiment all too well and I know it is a word that is true for many. Christmas, while it represents the beautiful and miraculous message of Christ’s birth can also hold another message—that of painful memories and dread. Perhaps it is a reminder of loved ones who are no longer here, of a divorce or some other broken relationship. Perhaps it is of family members that can’t get along and the tension that fills not only the room, but your heart as the knot in your stomach grows at the thought of the holidays ahead. But this is a word that resounded within my soul even as the pastor continued his message—Christmas is a season of change and hope and it is available now as you take hold of it. For those who will accept and receive it, there is change in the air. His Presence. 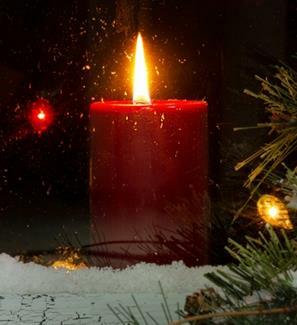 That like a candle once lit illumines a room, so is Christ in you and as you walk into a room you are a carrier of His light and His Presence, His glory to drive out the darkness of the ghosts of Christmas past. There is no need to fear. 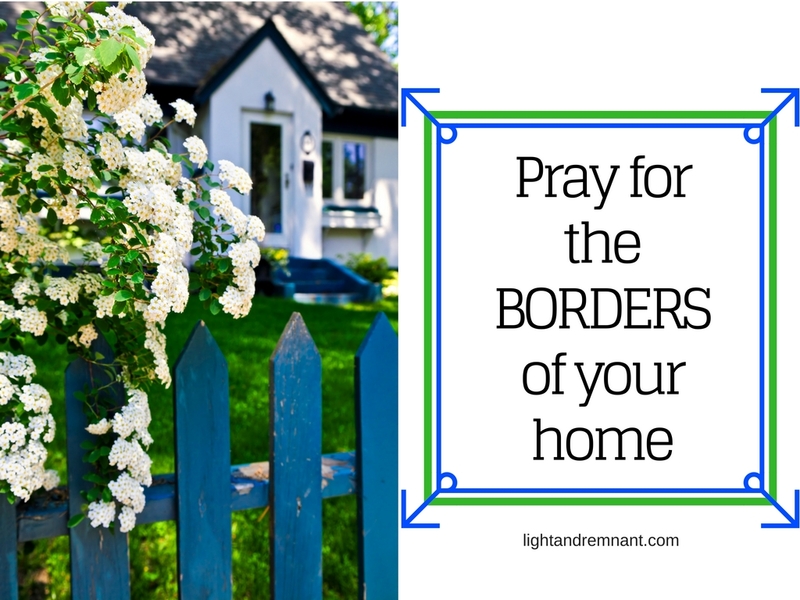 Instead let His joyful expectation fill your heart again as you bring Christ into your home and heart for that change for which you have prayed. Christmas is a time for miracles. It is time for there to be another birth this Christmas, that of renewed hope in your heart that nothing is impossible. Nothing. He is a restorer, a reconciler, a resurrector of that which has died. Can these dry bones live again? Speak it out and call them to life as His breath brings forth new life. Christmas may have complications, but His love is simple and simply put is available to change the past, present and future. Not long ago I had a dream of a young man who was being beaten over the head with a bat. He was curled in a ball on the street with his hands and arms trying fruitlessly to protect his head. I woke up gasping and in tears. “Lord, is this something that has happened or is this something that can be changed?” I asked.